I’ve got to 43 years of age and never been to a music festival… that is to say the sort of festival where one camps, shares toilets, doesn’t shower and generally prays for good weather… but not too hot so as to avoid hot and sweaty nights without a cold shower or any respite! So when Shellie said she’d like to go to the Henley 80s Rewind Festival but that the friends she’d gone with previously weren’t able to go this time, I thought to myself… 80s… there’s going to be slightly older people… who perhaps know how to use a public toilet… who perhaps won’t get blindingly drunk and throw up everywhere.. and in Henley, which I know and perhaps where I can blag a shower, if need be or a place to stay if it’s really that muddy or horrendous weather wise…. so I agreed! More than the above though and not being a ‘seasoned’ festival goer, which apparently is an assumption that by my age, I had no idea what I needed to take nor really gave it much thought… until Shellie called me 2 days before with a list of what she was thinking about taking and asking what I had! Errr I had a tent. Well that is to say I’d bought a 2 man tent a few years ago.. a funky groovy tent that I’d figured I’d be using with the kids in the garden over that summer.. it was still in the bag, never put up and never tried. But it was a ‘paint your own’ tent and that had to be a fun kinda thing to do, right? Or is that the fun kinda thing that ‘young festival goers’ do? Well this is my chance I thought. So that was in. Shellie then asked about food and cooking equipment and kettles and stuff… ahem, don’t you just call room service for that stuff? Loo roll? Surely that comes with the toilets? Sanitiser gel? Surely we would wash our hands? Oooh I’m really not equipped at all… but I know the campsite isn’t far from the town, so worst case scenario I’m sure I can nip to Waitrose! By the time Shellie arrives there is very little camping space available and I’m grateful for our little bijou tent for two. We find a spot to pitch our tent between others and our vista looking out onto another patch of grass that we perceive as our chilling out spot. Shortly after we manage to erect our tent (surprisingly without too much trouble) our new tent neighbours return and open up the door to their palatial mansion. Our little tent could fit in their tent lobby! They have 3 bedrooms (errrr tent language = pods), a whole kitchen (well 2 camping gas, ‘camping pantry’ and a bulging larder of food and drink). 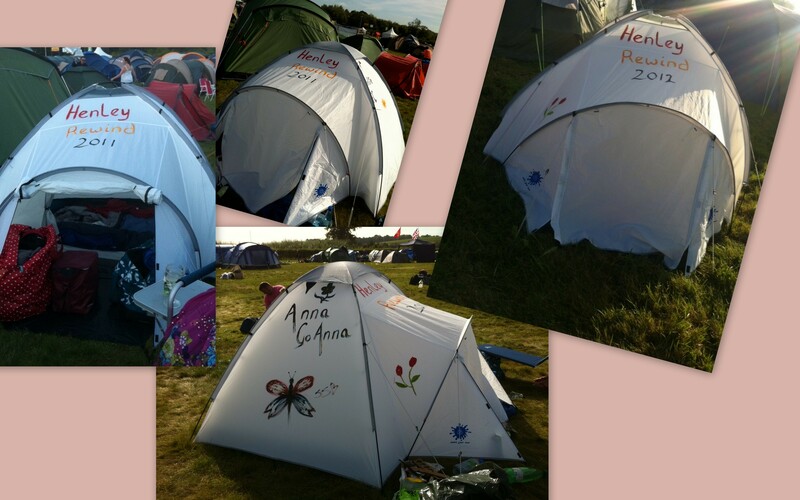 After a very short while we make friends with them and they help decorate our tent with the addition of some tulips… I’d managed to paint my name and a picture on one side; Henley Rewind Festival 2011 on the front; and Shellie had prettied her side in blue paint. It wasn’t long into the tent erection that Shellie had cracked open the wine box and we had started drinking. Fatal for me these days… I hardly drink and if I do, am now a very cheap date, getting piddled on a couple of glasses. But this was a festival. My first festival. Surely I could pretend I was in the 80s again and my alcohol tolerance was higher! Oh dear! So the event had started and we shared our neighbours nibbles with our wine – me being grateful for the little bit of nourishment and remembering (probably too late) that I had in fact not eaten anything that day! Ooops but perhaps more like the 80s than I care to recall! Being the novice that I am, I simply head off following the crowd and not at all sure what to expect. I had, of course, known that the actual festival didn’t start until Saturday and therefore had assumed (incorrectly) that we would pitch our tent and then head into Henley for a meal… hahaha how naive I am at my first festival. So when, following on sheepishly, we come across the ‘party area’ at the festival I’m a little surprised but go with the flow. It’s not long until the music starts up and it’s karaoke.. lots of people get up to sing loudly along to 80s music and the rest of us (now dancing on the picnic tables) are singing along (ahem) with them and boogying. Fortunately, and I think this may have saved me, I dance a lot and David (one of our new tent neighbours) manages to buy some big polystyrene containers with some chilli and rice in them. Not sure that in the cold light of day I would call them chilli and rice but hey… a bit of stodge was probably exactly what I needed.. and managed to shove down a few mouthfuls very gratefully. I poured myself into the tent around midnight… not a terrifically late night but definitely worse for wear. As the festival novice I’d made the first faux pas. Don’t get drunk when the toilets are totally grim to sit on let alone look down for a quick chuck! Bearing all that in mind when the booze wore off and I realised that I was in a hot and sweaty ickle tent feeling decidedly unwell, desperate for either a pee or a vom. Not a great start to a weekend of camping. Oh dear what must our new tent neighbours think of me.. and oh dear didn’t I see some of my old colleagues last night when I was dancing on the table too… and oh dear did I swear a lot? Oh generally.. oh! Not so early in the morning, I crawled from the tent out onto a rug outside the tent in my PJs and unable to face food or drink. Our neighbours were making sausages and scrambled egg… tea or coffee was on offer… but all I could do was feel remarkably sorry for myself and try hard not to be sick. An hour or so later, our tent neighbours having left to go home for a shower, I suggested to Shellie that we walk along the towpath to Henley for a bite to eat and a clean toilet. It was a slow walk and one that was accompanied by a bottle of diet coke – I find the fizz always helps. A lovely salad, large fizzy water, a sit down, splash of faces and, of course, toilet break later, we topped up on provisions (replacement box of wine for one!) and went to head back to the camp… and then the rain came! Well I guess it wouldn’t be a festival if it didn’t rain… but me being me, I’d left all wet weather gear firmly in London having resolutely decided that it would be good weather all weekend. Henley had sold out of any rain ponchos, rain coats or anything vaguely festival dry gear… so we bought some bin bags and fashioned ourselves some dapper outfits to keep dry. As time was marching on and China Crisis were due to be on at 2pm we decided to head for the river taxi to get back to camp.. besides it was still torrential rain and we had heavy wine to carry (ewww the thought of drinking the wine, really wasn’t high on my agenda, but hey!). 1.5 hours later we managed to get on a taxi – we weren’t the only ones who’d had the idea – making it back to the campsite after 2pm. The rain started to ebb away and the sunshine sneaked out from behind a cloud… we headed toward the arena to find a spot and watch the music acts. After a short while we found our neighbours and made up a fabulous party with them sharing our wine (smuggled in)… I however was on fizzy pop, still unable to face wine. 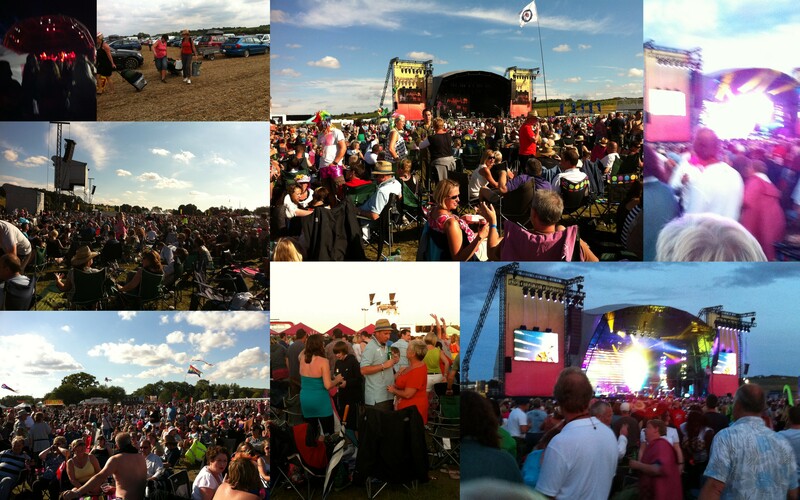 What an absolute hoot the festival was. As I looked around it was evident that there were a few interlopers but the majority of people there were late-30s-50s in age, slightly rounded around the middle, not afraid to sing out to the chorus of every song and importantly just simply letting down what was left of their hair! Importantly though I was astounded at the manners and kindness of most people there. When you tried to get out to the bar or for food and stepped around people’s picnic rugs, people would talk to you or have a giggle with you and nobody seemed to mind when you had to nudge them out of the way. There was general sharing of drinks and even of general space. Something that amused our group was that Shellie, who was by now tucking into the vodka, snuck in disguised as a bottle of water, was making ‘friends’ with everyone. It was hysterical, she would wander off to a neighbouring party and chat away to them as if an old friend. Even more amusing was when she would be going to the bar or the toilet we worked out her way of finding her way home was to mark her territory as she edged through the crowd… no not peeing on everyone but by chatting to them and during conversation pointing back to us, perhaps telling them she was with our group. When she would return later, she would find these people and stop for a chat with them… during which time we would see one of their party point in our general direction, perhaps trying to usher her back to us… but instead ushering her to next marshall point where the same thing would happen. I’m quite sure she’s made a heap of new friends… but I’m not quite sure if she’d remember who they were, even if they quite clearly would remember her. I have to say though that the funniest one was on the final day when a lady who’d been in a group in front of us was seen holding Shellie’s hand and escorting her back to our party – it wasn’t until she’d done that and then left again that we realised she’d not even been coming in our direction but had accompanied Shellie for the good of her health! The funniest part though is that I really don’t think Shellie knowingly marks her route, more the homing pigeon instinct at a festival. The final day of the festival I felt remarkably better than I had the day before… probably due to my only being able to face a couple of small vodkas on Saturday and waking up without a hangover in the bijou tent. It was also a huge bonus to know that we were to head off with our new tent neighbours to Helen’s house for a shower and brushup… I know that of course we weren’t terrifically dirty and actually looked relatively respectable but we’re used to showering/bathing every day so to go without somehow seems dirty. Strange really but I guess that’s what we’re used to. I also can’t tell you how brilliant it was to also use a toilet that flushed and be able to know that you weren’t sitting on top of a pile of other people’s p**.. what joy… what simple pleasures! Sunday’s lineup was huge – well if you’re from the generations that remember the 80s that is. Once again we were drawn into the music, danced our little feet off and sang to all the choruses and drifted off to the 80s and memories that had once been such a valuable part of our lives. Sunday however was blisteringly hot. Sunburn-a-go-go despite us having covered ourselves, sensibly, in factor 30. Another observation was that there were children post-80s generation at the festival. Some were with their parents and quite clearly had been ‘educated’ on the 80s songs… in fact scarily knowing more verses and words than we did… and probably more in tune than we were too. But then there were others… who were there of their own choice. Perhaps because it was a festival. Perhaps because they knew the songs… but probably because they knew the songs second or third time round! Hahaha how many tunes have been released by a newer artist since the 80s and the ‘kids’ think they own it? Don’t you love those conversations when you’re questioned by a youngster about a song with the rolling of eyes assuming that you wouldn’t know it cos you’re old… and then doubting that it could possibly have been a song sung by anyone other than the new band…. but there were quite a few youngsters who were there singing along and I did overhear someone say ‘this is XYZ’s song’ implying that their band had it first!! The crowd was thinning out during Sunday as people headed home, ready for work on Monday. What a shame to be part of the festival but to in fact miss a large part of the music on the Sunday night.. and of course miss the headline act. When we had returned to the campsite after our showers we noted that there were lots of space in the campsite, people ferrying back and forth with packed up tents and camping equipment, moving cars nearer the field exit so that they can make a quick getaway when they’re ready to go… also quite probably aware that the rain of the day before had mashed up the field somewhat and anything less than a front wheel drive or 4-wheel drive may have difficulty escaping if the rain comes again. As Shellie and I collapsed into our tent on Sunday night we felt exposed to the elements far more than we had done. Our bijou little tent had nestled in amongst the grown up festival goers tents… but now most of them were gone and we had big blank field space around us. However as we woke in the morning (without our tent neighbours and their welcome cups of tea), we realised that in fact a great many people had in fact stayed on and there were plenty of people there… the downside to this was simply that the toilets hadn’t been emptied, expecting people to go home, and making it more revolting than you could possibly think… Shellie braved it… I decided not to drink anything in the hope that I could survive until a flushing loo presented itself! I know I’m a woose. But honestly I gag at the slightest yuckiness. All my neices, nephews and small people in my life know that Auntie Anna doesn’t DO bottoms! Seriously I love the kids but don’t leave them with me until they can wipe their own arses! Another big bonus to our staying on until Monday (as well as being at the whole festival) was that the sunshine of Sunday had dried the field out, our tents and sleeping gear wasn’t dripping wet AND our exit didn’t take an age. Tent neighbours, Helen and David made mention that their exit the night before had taken them 1.5 hours go less than half a mile! But then again they had been able to have a shower and get into a bed! So will I do it again? BUT, will be more prepared and take food and drink with me; not to drink quite so much on the first night and pace myself; get a bigger tent so that if it does P with rain we can at least stand up or host a little soire in comfort; also will arrange somewhere to disappear to for a shower and pee every morning. Hey, at the end of the day I am an old bugga and need some mod cons…. at one point I did think that perhaps I could stay in the town in a hotel but that’s not the fun of the festival, is it? So would you go to a festival?